Sad news to report from Jamie Smart: Egmont's TOXIC have dropped his competition-winning Count Von Poo strip. "The Count has had four adventures so far in their pages, with maybe seven or eight left to print," he reveals on his blog. "These however won’t be shown." Regular downthetubes readers will recall Jamie won a competition to have a comic strip in TOXIC back in April (see news story), beating off stiff competition from the likes of Lew Stringer and Laura Howell. "The reasons why CVP has been dropped, were an unease with the kid-playing-with-poo interface," says Jamie, "which I always anticipated but we’d been tweaking the strips so as to be careful, and I thought we’d found a nice groove. "CVP was an immense amount of fun to write and draw, obviously. It’s a vampire who has imaginary adventures with faeces. How could that not be fun?" Jamie's a bit mystified as to its cancellation. "A fair few people I’ve mentioned it to have suggested the recent wacky e coli outbreak over here in the UK this weekend, making the subject of kids handling poo maybe a bit sensitive. I dunno. What I can happily say is that TOXIC said there’d been no complaints about CVP. None. Again, it’s a vampire. Who has imaginary adventures with faeces. and no one complained? Brilliant." Despite the loss of the Count, Jamie is discussing other potential ideas with TOXIC. However, given that Egmont own the copyright to other strips in the competition, perhaps they'll also look at those. As well as Lew and Laura, other contenders in the poll included creations from Luke Paton, , Paul H Birch, Steve Harrison, Paul J Palmer, David Hailwood, Paul Harrison-Davies, Shane Oakley, John Erasmus, and Stuart Arrowsmith. • The Hi Ex elves may have been quiet but they tell us they've been busy behind the scenes rushing around the country banging on doors and jumping through hoops to get their next Highlands convention shipshape. "We're working hard to try and get funding to put on more, bigger and better," says co-organiser Vicky Stonebridge. "We hope to get outreach events throughout the year and in the lead up to the event... watch this space." In the meantime they are now on Twitter at http://www.twitter.com/HiExComicCon. Plus, a member of the 2000ad online message board has come up with a transport solution, if you want to travel to Hi Ex 2010 in style... although we're not really sure a minibus really counts, what about a stretch limo for the weekend? • Indie publishers tell us that since putting our graphic novel Jack in the Box on digital books service Myebook six weeks ago, which includes links to the HD trailer and the full Jack in the Box website, 3,000 visitors have checked out the page. It's impressive but again, aside from a promotional tool, where's the revenue stream for publishers? • There's a great new interview with Rainbow Orchid creator Garen Ewing over on the Forbidden Planet International blog, which includes a peek at some artwork from volume 2 to enjoy. • Transformers comic book writer Simon Furman has teamed up with Titan Magazines' TotalSciFiOnline.com to launch 'Comics Candy', a monthly blog where he casts his eye over the latest comic releases. Read his first 'Comics Candy' post, which includes his thoughts on titles such as 28 Days Later and DC Comics Doom Patrol #1 and Batgirl #1 reboots, here. • Part 10 Paul Rainey's comic There’s No Time Like The Present is now available. It still costs only £2.50 and, if you live in the UK and buy it from his website: that includes postage to destinations in the UK. • Top artist Jon Haward reports there are now lettered preview pages of The Tempest (drawn by Jon) and Will Volley's Romeo and Juliet to view in the Previews section of the Classical Comics website. They look gorgeous: Romeo and Juliet graphic novel is out to buy now in three versions - Original Text, Plain Text and Quick Text. The Tempest graphic novel will be out 24th September, also in three versions, and Jon will be signing copies of The Tempest and Macbeth plus posters on the 25th and 26th sept at the Ace Comic Gallery in Colchester, his only sigining this year. More details on his blog here. • And finally, talking of trailers and promotions, there's a promotion for comics writer Jaspre Bark's new novel, Way of the Barefoot Zombie here on Youtube.... great fun! And Another Thing by bestselling author of the Artemis Fowl series, Eoin Colfer, is the sixth novel in the ever-more increasingly inaccurately named 'Hitchhiker's Guide to the Galaxy' trilogy. So if you've ever faced a death ray in your dressing gown, done six impossible things before breakfast or proved the non-existence of God with a fish in your ear, then here’s your chance to show that you are the hoopiest frood on this side of the galaxy. All you have to do is to prove that you are the greatest Hitchhiker fan on video in no more than 42 seconds, post it on YouTube and tag the video with the words ‘sixofthree’ and ‘AAT comp’ and then drop Penguin an email at partsix@uk.penguingroup.com. The video that is deemed by Penguin to demonstrate in the funniest or cleverest way how much of a Hitchhiker’s Guide to the Galaxy fan the creator is will be chosen as the winner. The winner will get two tickets to Hitchcon 09 on Sunday 11th October 2009 at London's Royal Festival Hall (for further details about that, see below), two nights’ bed and breakfast at the Marriott County Hall hotel for the weekend of the event, an evening meal at Skylon restaurant a personalised dressing gown and towel, as well as being crowned as the official Number One Hitchhiker fan at Hitchcon. HitchCon 09 offers fans to join publishers Penguin for a PanGalactic Gargleblaster, come attired in dressing gown to take part in a record-breaking Arthur Dent photocall, be the first in the world to hear excerpts from and purchase Eoin Colfer’s And Another Thing..., see free screenings of the Hitchhikers TV Series in the Clore Ballroom, head to the Royal Festival Hall to listen to friends and experts discuss the life and work of Douglas Adams or thrill to watch Simon Jones as Arthur Dent alongside the original Ford Prefect, Zaphod Beeblebrox, Marvin the Paranoid Android and Trillian re-create classic moments from the saga live on stage – radio-style (directed and produced by Dirk Maggs). Whatever your choice on the day, for any self-respecting Hitchhiker’s/Adams fan, one thing is assured, Southbank Centre is the only place to be on Sunday 11th October. • Hitchhiker’s Guide to the Galaxy: Part 6 of 3 And Another Thing... by internationally bestselling author Eoin Colfer will be published by Michael Joseph in hardback on 12th October. (With thanks to Clare Walters): Kseniya Simonova is a Ukrainian artist who creates sand drawings in front of audiences. Here she is performing on Ukraine’s Got Talent, recounting Germany conquering Ukraine in the second world war. It's just stunning. Who needs Susan Boyle, eh? Hot on the heels of what seems to have been a popular giveaway, judging by the scant number of copies in local newsagents, The Guardian is following up its week-long comics promotion with two guides for budding artists being given away in the Guardian and sister Sunday newspaper the Observer this weekend. The Guides to Drawing and Painting - free with the Guardian on Saturday (19 September) and The Observer on Sunday, are produced in collaboration with the Slade School of Art and the University of Gloucestershire. The guides will prove to be a useful starting point for anyone interested in learning how to draw (including the comic artists of the future!) or wanting to 'brush-up' (groan) on their existing skills. Three art tutors at the University of Gloucestershire have drawn upon their years of experience to produce a the 66-page Guardian Guide to Drawing circulated free with the newspaper on Saturday, penning a series of exercises to inspire even complete beginners to pick up a pencil and start to sketch. Mick Maslem, who recently retired after teaching drawing and painting to foundation students at the University for more than 30 years has teamed up with fine art tutor Jack Southern, senior lecturer in illustration and drawing, Jennifer Whiskerd and London-based Atul Vohora to produce the guide. “Mick sent in a rough draft of a book that he'd had on the shelf for years," explains Nell Card, of Guardian News and Media, "a selection of teaching notes and exercises that he'd found had produced exciting, unusual results amongst his students over the years. “We were really keen for the guide to be unlike the any guides we'd seen in the shops: we wanted the exercises to be encouraging, innovative and non-prescriptive and Mick's lessons were exactly that. "Working on the guide with Mick and Jen has been a fascinating experience," says Jack. "Coming up with ideas and writing new exercises was an extremely exciting creative process. The Guide also features contributions from Grayson Perry and Louise Bourgeois. Bryan Talbot has been in touch to give us the rundown of dates for his signing tour to promote his ace new graphic novel, Grandville (read our review here). The presentation 'Grandville and the Anthropomorphic Tradition' is at 14.30 in the theatre. Saturday 10th October 2pm - 4pm: Signing at Gosh! Saturday 10th October 6.30 - 7.30pm: "In conversation with Bryan Talbot"
The second issue of indie anthology title New British Comics, featuring this spiffing cover by Nelson Evergreen, should be published in October. Contributors for the 84-page anthology, which will be published by Karol Wisniewski in both English and Polish, include Dan White, Dave Thomson, Paweł Gierczak, David Hailwood, Tony Suleri, Maddku, Jacek Zabawa, David Robertson, Frank Lamour, Rob Miller, WJC, Jon Edwards, Tony Hitchman, Lawrence Elwick, Paul O’Connell, Leonie O'Moore, Iain Laurie, Craig Collins and Nelson Evergreen. "I hope I've quietly perverted the idea of 'Britishness' here," says Nelson of his fab cover, "what with the tea drinkers, bowler hatted gent and ominous skies rendered in a vaguely European sort of style and topped off with a decidedly shop-soiled Union Jack." UK Indie distributor SmallZone is still selling the first issue of New British Comics, which features 13 stories and 17 artists including Dave Thomson, Malcy Duff, Paul O’Connell and Rob Miller. The contents and strips are the same in both editions but the only difference is language. 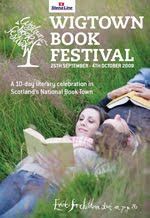 Wigtown in Dumfries and Galloway is Scotland's National Book Town and advertises itself as "a book lover's haven" with over a quarter of a million books in twenty book-related businesses. It is not surprising therefore that it has its own book festival. This year the Wigtown Book Festival programme has more than 170 events over 10 days at the end of September and the start of October with authors such as Iain Banks, Roddy Doyle and Nick Nairn appearing. Also in the programme are two comics related events featuring writers Alan Grant and David Donaldson. On Saturday 3 October at 1:30 pm Alan Grant will be interviewed by Stuart Kelly on the subject of his work on Batman and Judge Dredd as well as adapting Robert Louis Stevenson's Kidnapped for the One Book-One Edinburgh reading campaign. The event will take place in the Stena Line Marquee in the town's main square and tickets cost £8 for adults and £4 for children. The next day on Sunday 4 October, DC Thomson editor and writer David Donaldson will give An Audience with the Broons at 3 pm. Donaldson has been the scriptwriter for the Sunday Post's comic strips The Broons and Oor Wullie on and off since 1962, during which time he's been party to all the Broon family secrets, such as Pa Broon's flutters on the horses and his need for ample supplies of baccy. The event will also take place in the Stena Line Marquee and all tickets cost £8. More details of the Wigtown Book Festival and its events including on-line ticket purchasing can be found on the festival website. 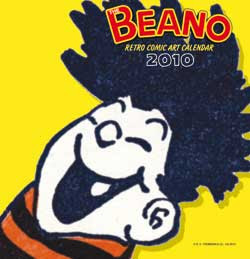 It is that time of year when next year's calendars are hitting the stores and the one to look out for at the moment is the Beano Retro Comic Art Calendar. With the weekly Beano falling into line with the new CBBC TV series Dennis and Gnasher series, older Beano fans should be pleased to see that the calendar features vintage Beano art selected by former Beano and BeanoMAX editor, Euan Kerr. For those readers north of the Border, it is the Brown clan's turn to be featured in DCT's softcover annual this year and they are of course also featured on the new Broons calendar for 2010. 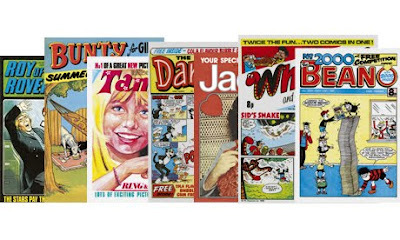 From humour to adventure and good news for the girls - after all the Jackie compilation books from Carlton, DC Thomson have finally decided to publish a Bunty compilation book this year. Bunty For Girls: Golden Age Classic Stories costs £8.99 and includes the first adventure of Bunty favourites The Four Marys amongst many other strips. All the DC Thomson items mentioned here are available via the DC Thomson website and postage is included on all the website's prices. Also still available from last year is the slipcased reprint of the 1966 Hotspur annual which has been reduced in price to £8.49. Away from DC Thomson and over (almost) to Look and Learn. 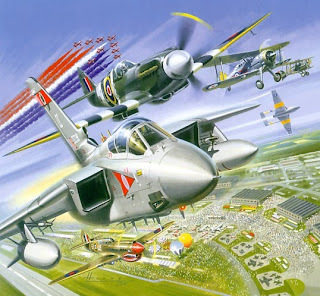 Regular Look and Learn aircraft artist Wilf Hardy has produced many painted covers for UK air show brochures, as can be seen on Jeremy Briggs' piece on him over on Bear Alley. A selection of these paintings for the annual air show at RAF Waddington have now been produced as special limited edition packs with proceeds going to the RAF Benevolent Fund and the RAF Association. The set of 14 A5 prints feature 10 paintings by Wilf Hardy, 2 by his replacement on the Waddington brochures Tim O'Brien, and two joint efforts. Price is £5 plus £1.50 UK P&P and they are available by sending a cheque payable to "Timothy O'Brien" to 15 Angelica Court, Bingham, Nottingham, NG13 8SU. There are more details about the packs on Tim's website. If you like Hardy's aircraft illustrations in Look and Learn then these are well worth purchasing. And finally for now back to DC Thomson and their Waverley Books imprint which has had great success in the past few years selling Broons spin off books beginning with the high quality Maw Broon's Cook Book. This year the new Broon's books from Waverley have included The Broon's Days Oot! and Maw Broon's Remedies An' Suchlike while October will bring The Broons' Book of Gairdenin' Wisdoms in time for Christmas. 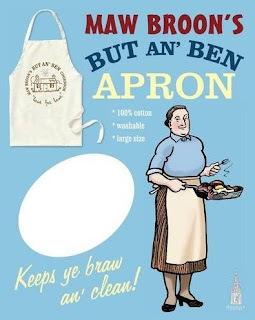 For those messy cooks who have been using both the Cook Book and its follow up the But An'Ben Cook Book, then Maw Broon's But An'Ben Apron is also now available to buy from Waverley Books - "It keeps ye braw and clean!" An eight-page preview comic of the new US series of The Prisoner is available to download from US production company AMC's web site here. The Marvel custom comic features art by Brazilian artist Amilcar Pinna, with colouring by Chris Sotomayor, whose credits include Captain Marvel and Fantastic Four. The AMC page also offers several posters marking the launch of the new interpretation of the 1960s cult classic series which stars Jim Caviezel (The Passion of the Christ, The Thin Red Line) as "Number Six" and two-time Oscar Winner Ian McKellen (Lord of the Rings, The Da Vinci Code) as "Number Two." In the new series a man, known as "Six", finds himself inexplicably trapped in "The Village" with no memory of how he arrived. As he explores his environment, he discovers that his fellow inhabitants are identified by number instead of name, have no memory of any prior existence, and are under constant surveillance. Not knowing whom to trust, Six is driven by the need to discover the truth behind The Village, the reason for his being there, and most importantly -- how he can escape. No screening date for the series on co-producer ITV in the UK has been announced as yet. Solipsistic Pop - an anthology that features the very best in alternative UK comics - has launched its website with a manifesto that states the intentions of a new wave of comic artists taking over the UK alternative scene. With contributors that include Anna Saunders, Daniel Locke, Philip Spence, Stephen Collins (above) and Tom Humberstone, Solipsistic Pop is to be a biannual anthology designed to spotlight the best in alternative comic art from the UK. "It features diverse, beautiful, twisted and peculiar Comics that you won’t be able to find anywhere else," explains Humberstone. "Comic artists old and new are encouraged to contribute. Solipsistic Pop intends to provide a support structure and outlet for UK alternative Comics. "Each book of Solipsistic Pop will be a boutique, tactile product: an interactive, unique artefact designed to suit the content of each edition with an extremely limited printrun." The website will be updated with previews of artwork from the first book, to be published in November, essays, news and related live events. The official fan club for Thunderbirds co-creator Gerry Anderson, Fanderson, officially launched its new online Forum to replace the club's ageing Yahoo group yesterday (on the 10th anniversary of the day the earth was blown out of Earth's orbit in Space: 1999!). The new online offshoot for the popular club - which has featured Anderson-related comics coverage in the past - consists of a public forum that anyone can join and contribute to and also a private forum for paid up Fanderson members only. This year’s Comica festival in London, has announced the addition of North American superstar guests James Jean and Tara McPherson to its line up. Their appearances will be a free instore signing on Thursday 12th November at Comica partner and sponsor Orbital Comics, and an evening discussion and illustrated presentation at Comica, in the Nash Room of the ICA, on Friday 13th November from 6.45pm to 8.15pm, followed by signings. Their presence in London is also made possible by Comica partner Offset 2009, the Dublin design conference on November 6-8th, where James and Tara are joined by Dave McKean, David Shrigley, Chip Kidd and many other luminaries. "I'm hugely grateful to Offset for supporting Comica to bring two of their major invitees to London," says Comica director Paul Gravett. "From Comica’s debut with Ware, Burns and Sacco in 2003, collaborations and co-operations of this kind with other European festivals have been fruitful and successful, enabling this festival to host world-class international creators." Born in Taipei, Taiwan and based in Los Angeles, James Jean has emerged as one of the 21st century’s most dazzling illustrative visionaries. Within the comics field, he's probably best-known for his lusciously inventive covers for the Vertigo series Fables. He has also exhibited his paintings and designed wallpaper, fabric prints and an animated video for fashion label Prada. Jean will be launching in the UK his latest productions: The Kindling Portfolio, a collection of 12 oversized frameable prints of new paintings housed in an attractive portfolio from Chronicle Books; and Process Recess Volume 3 from AdHouse Books, which collects his sketchbook drawings into a classy hardcover. Named "the crown princess of poster art" by Elle magazine, the San Francisco-born Tara McPherson has fashioned her own world of seductive, thought-provoking imagery, collected into the hardback artbooks Lonely Heart and Lost Constellations from Dark Horse. As well as illustrating numerous gig posters for Kings of Leon, Beck, Depeche Mode and other rock bands, she's evolved into a hugely influential commercial artist and fine art painter based in New York and developed a range of sculptures, installations, apparel and merchandise. She has contributed covers and comics to Vertigo, including Sandman Presents, Witching Hour and Fables: 1001 Nights of Snowfall. Cristina Winsor, a US citizen and artist from the downtown East Village New York scene innocently arrived in London on Sunday 6th September to visit friends and take part in a free five day The Meaning of Art in the respected east London venue The Foundry - only to be detained for nine hours in a detention centre at Heathrow airport and escorted on an outbound plane back to New York by armed security guards. Her crime? Carrying two small paintings under her arm, which she wished to exhibit at the festival and with a bit of luck, sell for a few hundred dollars. "The immigration officials told me that selling my work was illegal without a business visa, and took me to the detention centre for further questioning," says Cristina, a 32-year-old artist living in the East Village, New York, who has exhibited her work across the US. "I told them I wouldn't sell my paintings if it was against the law,” she continues, “and even offered to leave them at the airport so that I could at least stay in the country and see my friends, and pick them up on my way out. They said they couldn't trust me to have changed my mind so fast, and that they couldn't show me favouritism by holding my paintings until my return flight four days later. "I then sat in the immigration detention centre for nine hours and was escorted to an outbound flight by security. They only gave me back my passport once I disembarked in JFK airport in NY. I opened my passport to see a little 'barred entry' symbol." Cristina is the latest victim of the new immigration regulations which took full effect in November last year, wreaking havoc on international arts events across the UK, preventing artists, poets and musicians from taking part in numerous festivals and other arts projects. Invited artists from the non-EU area are now required to be “sponsored” by a UK organisation at considerable cost under the new points-based system. Copies of official documents, such as passport and biometric identification are required to be kept by the host, and should the invited artist’s whereabouts become unknown, the host is legally obliged to inform the UK Borders Agency. Phil Woolas, Minister for Borders and Immigration introduced the new Business visitors rules last October, stating that with the introduction of “an Australian-style points based system for selective migration, it makes sense to tighten visit visas at the same time.” (Readers may recall it was Woolas who received the full brunt of Joanna Lumley’s successful campaign to enable Gurka soldiers to live in the UK). “In the past, artists had no problems entering the UK for short visits to participate in arts events," says Manick Govinda, artist producer at Artsadmin and campaigner for the civil liberties group, The Manifesto Club, which has documented victims of the new rules, and who set up a petition against the Home Offices restrictions on non-EU artists (sign here, if you haven't already). "Yet again, these draconian immigration rules criminalize invited artists who pose no security threat and are not robbing British artists of work, yet these are the reasons that the Home Office have given for imposing these jackboot style laws – to prevent terrorism and safeguard British jobs. Art luminaries, writers and theatre directors such as Antony Gormley, Rachel Whiteread, Jeremy Deller, Benjamin Zephaniah, Blake Morrison and Nicholas Hytner have signed the petition. The Manifesto Club, which also campaigns on a number of other government measures, launched the petition against the Home Office’s restrictions on non-EU artists and academics with a letter to the Observer in February and a Guardian news story and has documented hundreds of incidents where the new immigration rules have devastated arts events (PDF format). The report was launched in a major news story in June 2009 in The Times. • downthetubes regrets to report the passing of illustrator and comic colourist Ian Mckie last Monday, aged 58. Bryan Talbot reports his heart stopped during what's been described as a "horrific" asthma attack. The twin brother of Angus McKie, Ian was colourist on comics such as Neil Gaiman's Phage: Shadow Death (right), Al Davison's Teknophage, sometimes art assistant to Angus, and Mac mentor to people like Bryan, Dave Gibbons, Brian Bolland and Viz Comics. Our condolences to his family. • Talking of The Guardian, if you haven't already seen the news elsewhere (I've been on holiday), this British national newspaper is giving away facsimile copies of some famous British comics this week: a Valentine's issue of Jackie kicked off the promotion on Saturday, complete with a strip featuring Donny Osmond dressing up as a hippy to avoid screaming fans; The Beano is being given away free in today's Observer (the Guardian's ailing sister Sunday). Monday's Guardian has Roy of the Rovers (the one where Roy Race is shot from 1981), followed by the Bunty 1972 Summer Special on Tuesday, The Dandy with the last Korky the Cat cover from 1984 on Wednesday, the first Tammy from 1971 on Thursday and an issue of Whizzer and Chips, two comics in one on Friday. To celebrate the promotion, Jon Ronson travelled to the Beano office to try his luck at their ideas meeting last week. Among other features, the paper has also ran a round up of celebrities identifying their favourite comics and, perhaps of most interest, carried a feature where kids were asked for their views on the giveaways. Most telling are girls preferred reading in the absence of comics for them today, including Grazia and Vogue; and a damning indictment on some modern comic giveaways.